Apple on Wednesday unveiled a thinner, taller, faster iPhone 5 at a highly anticipated event in San Francisco. The device, which is 18% thinner and 20% lighter than the iPhone 4S, is the thinnest smartphone in the world, according to Apple. 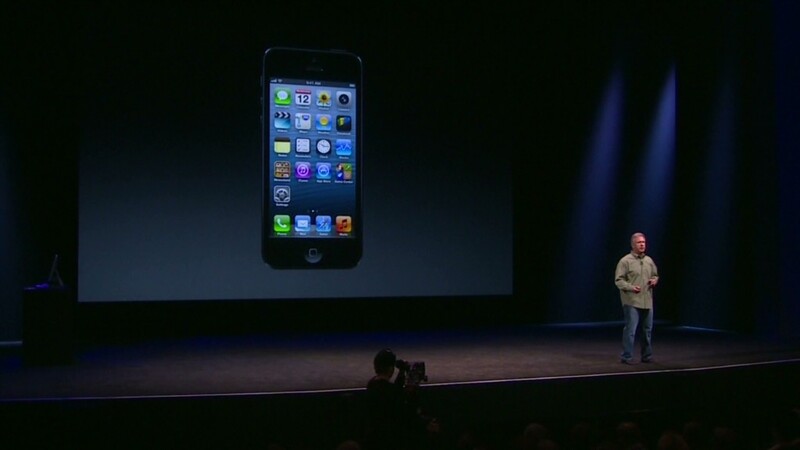 With a four-inch screen, the iPhone 5 allows for five rows of apps -- one more than previous versions of the device, which sported a 3.5-inch screen. Apple said the iPhone 5's processor speed is twice as fast as the previous version, an advance made possible by the company's new "A6" chip. The iPhone 5 is also the first Apple smartphone to have 4G-LTE network connectivity, which allows for speeds of up to 10 times faster than 3G, or about the same as the average home broadband connection. In the United States, the iPhone 5 will be compatible with the LTE networks supported by Verizon (VZ), AT&T (T) and Sprint (S). The new smartphone features an improved "iSight" camera, with a better ability to take low-light photos and a new mode that allows for panoramic shots. It also allows users to take photos while shooting videos -- an increasingly popular feature found on rival smartphones. Another new feature (correctly foreshadowed by rumors) is "lightning," Apple's new eight-pin connector, which is significantly smaller than the 30-pin connector that Apple has used since 2003. Apple will sell adapters so people can still use old chargers and legacy connectors -- but they're pricey. The gizmos will cost $29 each, or $39 for versions with attached cables, according to a listing in the Apple Store. The updated iOS 6, the iPhone's new software, will be available for download on most older versions of the iPhone on Sept. 19. Shares of Apple (AAPL) were up slightly by the end of the event. Ahead of the announcement, Wall Street analysts predicted that the iPhone 5 would set sales records. The industry's median prediction is that Apple will sell 45 million iPhone 5 units in the first three months after it hits store shelves. 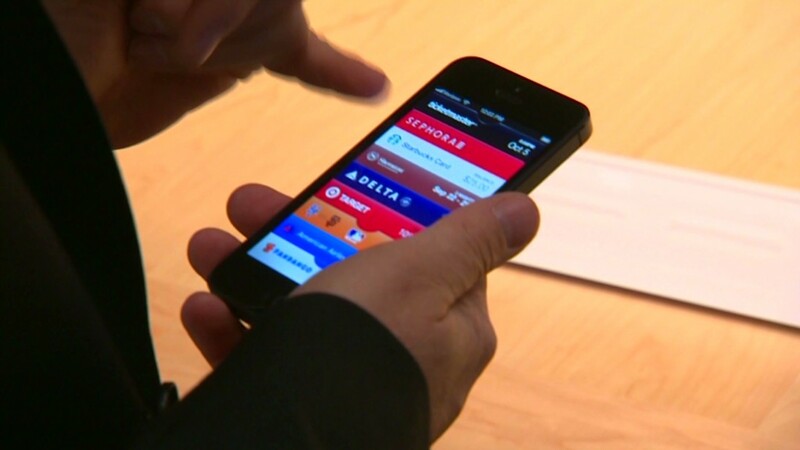 It sold 37 million in the first quarter after the iPhone 4S went on sale last fall. But industry research firm NPD cautioned that sales may be slower than expected, at least in the U.S., because the smartphone market is getting saturated. "Blowing away all weakened competition, as Apple has done to this point, makes it infinitely harder to continue to blow away the remainder," analyst Stephen Baker wrote. IPod: In addition to the iPhone unveiling, Apple announced two new updates to the iPod, which will go on sale in October. The new iPod touch was modeled after the iPhone 5, with a four-inch screen, a faster processor and a thinner design. The device will feature Siri and five different colors. The iPod nano got an even more radical redesign. The tiny music player is now 38% thinner than its precessor, and it comes with a larger, 2.5-inch touchscreen, Bluetooth, widescreen video playback, and controls on the side of the device. Apple also showed off the new iTunes 11, with an improved layout and iCloud integration. The new iTunes is scheduled to launch in October. The company unveiled new "EarPod" headphones too, which attempt to solve the "one size fits all" problem with a contoured design. Apple did not announce a widely expected seven- or eight-inch iPad "mini" that the company is believed to be working on, or an overhaul for Apple TV. Those products would have overshadowed the iPhone, which was the star of the day.